Home » News » Is Your Marriott Hotel HSIA Brand Compliant? Cloud5 Communications is consistently rated a top Marriott Internet supplier in Marriott’s monthly vendor scorecard for the Americas. 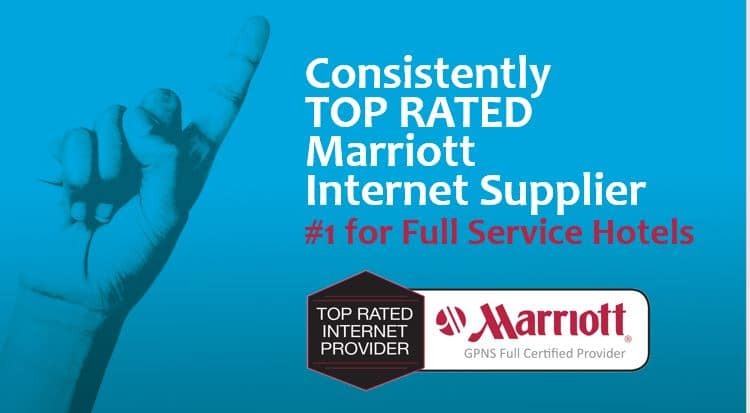 We are now working with many Marriotts that must upgrade to the current GPNS Internet standards by the required July 2019 deadline. For more compliance information, contact us at marriott@cloud5.com. High-performing Internet access is the #1 demand/complaint from travelers. In other words, it is mission critical to your hotel’s competitive performance. Brand leaders like Marriott know that when a guest selects one of its properties, they expect an optimal experience. One of these expectations is consistent, high-quality Internet service. And their satisfaction will show in your property’s guest scores. Marriott developed and maintains Global Property Network Standards (GPNS) for High-Speed Internet Access (HSIA) services. Recently, Marriott released new GPNS standards to ensure its properties meet the high brand standards the company has set in the hospitality industry. In order to ensure its global network of properties are able to provide this level of service and are fully compliant by July 2019, it is requiring all properties with GPNS versions of 2014 or older to upgrade to current HSIA brand standards. Are You HSIA Brand Compliant? While Marriott’s HSIA brand standards create a consistent, high-quality guest experience across its brands, these stringent standards require advanced internet management capabilities that evolve with changing guest demands. If your system hasn’t been updated in the last three years, you will need to upgrade now. Compliance requirements affect former Starwood brands as well. Seamless, personalized experiences require systems that not only provide quality HSIA, but also the backend network systems that ensure hotel operators have the analytics to stay ahead of the curve. In fact, in a 2017 Lodging Technology Study by Hospitality Technology, more than half of respondents indicated that while IT budgets will increase, investment dollars have shifted to building infrastructures that will not only support frictionless experiences but will also incorporate data and analytics capabilities. Marriott’s full certification expands to include back-of-the-house access for its associates, as well as advanced back-office network management. In addition to the current level of enterprise-wide converged network support Cloud5 provides, our guest engagement partners, such as intelligence-driven Volara, can help improve guest service and reduce service costs leveraging the WiFi network. In today’s world knowledge is power, but better margins are even more powerful. Having access to accurate, current data on your hotel’s network can open up entirely new opportunities to revenue, highlight areas for cost reductions and enable you to plan for evolving guest demands. Is your hotel compliant? If you aren’t sure, we will provide you with a free GPNS audit to identify any gaps you may have in your network. With hundreds of Marriott hotel installations under our belt, Cloud5 is a proven partner for Marriott brand properties. To become eligible for our Limited Time Free Support offer, schedule your complimentary phone audit or contact us at marriott@cloud5.com.